Sometimes a movie and its subject intersect in ways that transcend the traditional narrative and the creative process serves to illustrate exactly what the film is about. 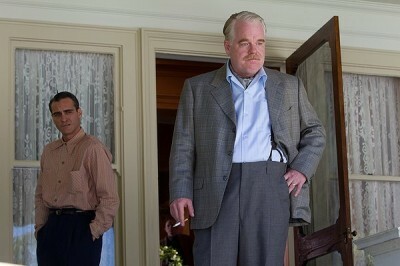 In Paul Thomas Anderson's latest, The Master, Philip Seymour Hoffman plays Lancaster Dodd, an author and philosopher who is trying to start a movement called "The Cause," in which he endeavors to explain and cure man's ills by looking through each individual's past lives and seeking the historical roots of their every malady. When he meets Freddie Quell (Joaquin Phoenix), a veteran of the second World War with post-traumatic stress disorder, his attention becomes focused on containing Freddie's madness. And one could say Anderson's endeavor here is not dissimilar. Making The Master was like trying to contain the madness, to create a vessel for an unwieldy, unpredictable, and untraditional cinematic story. There are moments in the film, which clocks in at well over two hours, where you will be sure that what you are seeing is an accident. The scenes play like Anderson let the cameras and the actors roll and watched what they came up with. At the same time, the writer/director, whose past credits include Punch-Drunk Love and There Will Be Blood, exhibits such control over the mis-en-scene, you could just as easily believe there are no accidents. Here, the auteur is clearly the master of his own efforts. The setting of the film is America in 1950, and the story travels from coast to coast. Dodd and his family, which includes Amy Adams playing his wife Peggy, go where the donors will have them, sidestepping critics and the law when necessary. Freddie is an alcoholic drifter who mostly gets wasted on his own concoctions. He finds whatever ingredients he can, stuff like paint thinner and fuel, and mixes them up into a mind-melting homebrew. He runs into Dodd while on the lam and crashes a party the author is having on a boat. Dodd feels a connection with this strange man, insisting they had some kind of important interaction in a past life. Maybe he is attracted to the primitive form, or it's also possible he legitimately wants to help a broken person get his mind right. Whatever the reason, the writer takes Freddie under his wing. At its most simplistic, The Master is really a relationship story between these two men. They are connected by fate, and Dodd refuses to sever his ties with Freddie despite pressure from his wife and kids. Their physical connection is almost romantic, but the writing and the performances transcend that. Dodd and Freddie are really two sides of one coin. The Master is seeking order, but his pupil is pure chaos. Both have the capacity for indulging in the opposite side--Freddie can marshal his thought processes when direct action is required, Dodd is prone to temperamental outbursts--making them a true yin and yang. Not solid colors, but with a drop of their opposite swirling around in the mix. There is a narrative arc to The Master, one that encompasses the ups and downs of the aforementioned relationship, as well as Dodd's efforts with "The Cause" and with curing Freddie. It's not really Point A to Point B storytelling, however, and to get hung up on the details of the plot would only diminish its uniqueness. Anderson takes his time with letting his characters be who they are, explaining the Cause through practice rather than exposition, and letting the outside reactions seep in slowly. 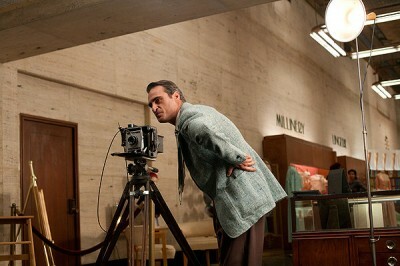 In some scenes, he and cinematographer Mihai Malaimare Jr. (Coppola's current go-to guy on films like Tetro and Youth Without Youth) stage elaborate set-ups where the camera moves over a distance, tracking the action, performers criss-crossing through the sight line; in others, they let a simpler montage, backed by Radiohead guitarist Jonny Greenwood's quirky score, move the story along. There are certainly some impressive showpieces within The Master, but the presentation is never showy. The mood is never broken by the director shouting, "Hey, look at me!" To that end, the cast maintains a similar level of control. Even Joaquin Phoenix, who is a bundle of tics and mannerisms, seems to know exactly where he needs to be at any given moment, when Freddie needs clarity or when he's off his head. Direct interrogations of the character by army doctors and by the Master are uncomfortable and raw. In a weird way, it almost seems like playing crazy for I'm Still Here was just a long rehearsal for this performance. Philip Seymour Hoffman pulls off more of a juggling act, shoring up every ounce of charisma he has, sliding from a glad-hand to an authoritative grip without breaking a sweat. A times, he is just there to be the rock against which Freddie beats his head, including a remarkable scene in side-by-side prison cells. Hoffman stands still through most of it, while Phoenix plays at being Charles Foster Kane destroying his wife's bedroom. Special note should also be made of Amy Adams, who is more often an observer than a participant, but who in a couple of key scenes, asserts an impressive dominance over her co-stars. Of course, it's Paul Thomas Anderson who is really in charge. Again, paralleling the plight of his characters, the road from conception to completion was a difficult one, with funding issues and pressure from Scientology groups over what they see as similarities between Lancaster Dodd and L. Ron Hubbard. It's amazing that he got the production up and running at all, much less bringing it together in such a way as to betray no compromise to his original mission. The Master is the kind of movie that only gets made every once in a while, it doesn't fit the cookie-cutter molds that studios prefer. It takes a persistence of vision to keep it on track, and Herculean mental acuity to stay clear-sighted all the way to the end. That The Master succeeds in every way means it is more than worthy of our enthusiasm and praise. It's as challenging and enriching as motion pictures get. 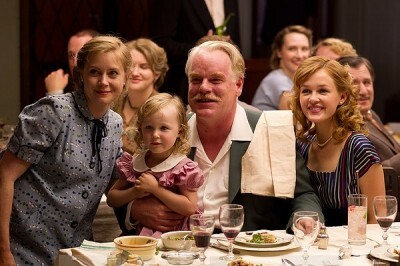 Buy tickets to "The Master" now!